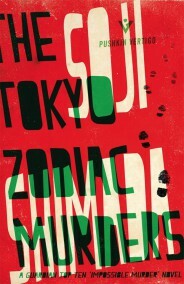 This is the mystery in Soji Shimada’s hugely influential debut novel The Tokyo Zodiac Murders, which launched a new type of crime writing in Japan known as shin honkaku (new orthodox) mysteries and is now finally back in print in English from Pushkin Vertigo. My only previous experience of shin honkaku was the massively entertaining The Decagon House Murders by Yukito Ayatsuji published by Locked Room International earlier this year and, like virtually everyone who read that, I was delighted when the reprint of this book was announced – Shimada bestrides this genre in his home country, and is seen as a key innovator in crime fiction for the work he has done (TDHM contains an illuminating foreword by Shimada and a superb afterword by Ho-Ling Wong that outline this very well indeed). It is also a highly-regarded locked room mystery, which is where my knowledge of and interest in it stems from, and has been one of my most eagerly-anticipated reads of 2015. So how does it measure up? Well, to be honest, I didn’t love it. Taking into account the fact that it was the first of its kind allows for many of the problems I have with it, but put into the context of the abundance of imposible crimes and novels of detection that were available significantly in advance of this it struggles to impress. The locked room murder of Heikichi, for instance, is disappointingly routine, and many of the key shocks in the narrative seemed a touch obvious (for all the speculation about Heikichi’s death and who picked up the reins of his scheme, there’s one key aspect that’s never touched…it struck me as odd that no-one had commented on this….and that’s because it was the solution). Additionally, I’m just not sold on the Ellery Queen-esque promises – two! count ’em! – to the reader of you having all the clues to solve the multiple murder…I mean, really? Technically, yes, but there’s some alarmingly esoteric knowledge required – plus one giant off-page leap by our detective – and so it hardly qualifies as fair play. Possibly on account of an overly-literal translation, it also reads like a novel written in the style of footnotes for most of its duration – the framing of solving the murders 40-odd years later is important, but the info-dump of the first third of the book to bring you up to speed is a killer. The dialogue is so on the nose that it would make Enid Blyton wince (“Yes, it’s amazing! I’m so lucky to know you!”) and the plot is replete with digressions into tangential matters – chemical equations of the action of poisons, for instance – rendered in dust-dry prose. Possibly there’s the argument that Shimada is enriching his milleu, but it’s done with no real care and you can spot these pointless digressions as soon as they appear because he suddenly starts writing travelogue or dropping in a directionless history lesson without any reference to the case. Thus the elements that play a part in the story are easy to pick out because they’re actually interesting or relevant, and those less interested than I might need to skim sections to get through it. But then comes the solution to the multiple murders. And it is brilliant. Actually quite frustratingly brilliant. Like, genuinely surprising and intelligent enough to justify the reputation it is credited with for creating the honkaku genre; reading this in isolation, you would immediately wish you could write a book with that much simple invention at its heart, and taken in that context it reminds me of the moment I finally got what was so good about John Dickson Carr’s The Hollow Man. Does it completely convince me? No, but I’m willing to forgive a lot of its problems for just how much chutzpah Shimada puts on the page. It’s just a shame that the last 20 pages don’t contain anything new, because it ends on a bit of a whimper when it should have gone out on a blinding and deafening cacophony. I’ve made no mention of the characters because there sort of aren’t any, and Shimada would be the first to admit this (he does it in his TDHM foreword, in fact). It’s not quite pure scheme – there’s too much redundancy for that – but as a window on another culture discovering the joys of intelligent crime fiction it is just about worthy of your time. Just don’t expect a timeless classic for the ages, however, although arguably the purpose of this type of origin is to get other people excited and encouraged to try themselves so that they may in time exceed you. And in that regard, it succeeds admirably. A quick word on the paperback edition – Pushkin Vertigo have done a fabulous job with this, from the eye-catching cover design by Jamie Keenan (who has designed all the covers in the series to date) and high-quality production to the involvement of Locked Room International’s John Pugmire, who has prepared this version for publication. If they produce everything to this standard, more power to them! ← #29: The spurns that patient merit of th’unworthy takes: To complete or not to complete? I started reading this book about a month back but gave up after reading the first chapter ! However, after reading in your review that the solution is brilliant, I’ll attempt again ! Yeah, it’s not a book that will be to everyone’s taste (which, of course, is true of every book ever published – good work, JJ) so I can understand your packing it in. If I was reading it without knowledge of its reputation, I’m not convinced I would have got through it, but I am glad I persevered. Hope you enjoy the solution as much as I did when you get to it…no Crooked Hinge-style controversy here! I’ve only read this, Decagon House Murders and Edogawa Rampo’s The Black Lizard (which felt to me like a Bond novel told from the villain’s perspective), and I enjoyed the honkaku stories much more than the Rampo – though, like Shimada, he’s an innovator and so more influential than necessarily good by today’s standards (see also: Edgar Allan Poe). The element of detection is certainly explored in a very interesting way, but I wonder if the language won’t translate so accessibly and so that might limit their appeal; John Pugmire of LRI described THDM as having ‘sharp elbows’ and it’s difficult to disagree with him. Overall, I suspect I may be too Westernised to enjoy Japanese detective fiction fully on its own merits, but when it strays into my patch I’m certainly curious enough to give it a go! Haha, I not sure whether I should apologise or not! The step it represents is very cool, you’re absolutely right, but I reckon there are better examples out there to be found (I thought TDHM a superior book, for example, and one with another staggering reveal). The question is…will anyone find and translate them? And yes, absolutely, read Paul Halter! Start with, oh, I dunno, maybe The Tiger’s Head. Or The Fourth Door. One of those two. I’ve been seeing this book a lot on the internet, but I was unsure about buying it. This review, informative and amusing as ever, has definitely resolved that issue! I found the narrative style hard enough to read in The Decagon House Murders, I don’t think I could make it through this one, regardless of the solution. My Carr novels have arrived so I think I shall stick to those for now for my locked room mystery reading. Yeah, it’s a tricky one – I’d like to be more enthisiastic about it, but I have to be honest about its flaws. Do keep it in mind, it is worth reading if only to see a key stage in the development of a genre, and appreciating something like that in a relatively contemporary work is a pretty rare thing. However, you have the joy of The Case of the Constant Suicides ahead of you now; let nothing distract you from that! I’m assuming the TCOTCS is a personal favourite of yours? It’s not Carr’s best, and it probably wouldn’t quite make my top ten Carrs, but for what it represents in my reading of him and for the sheer joy of it I will love that book in perpetuity. It also manages to balance the various aspects and themes that run through his work near-perfectly in a single book (and quite a short book at that), which is why I maintain that it’s the place to start with him. I sincerely hope that you enjoy it even half as much as I did. So do I! I think I had a bad start with Carr as my first one was In Spite of Thunder, which I didn’t really like. I get In Spite of Thunder and To Wake the Dead mixed up, as I read them practically back to back (same with Christie’s The Moving Finger and Murder is Easy), but I do remember that they were both rather talky and would be a slightly dissapointing place to start. For a guy who wrote so mucn brilliant stuff, it really is surprising how few of them are good starting places – he onyl really got the ba;ance perfect in a very small handfull of books, I’d say. once you’re on board you’re fine, but those first few can be quite crucial (unlike Dame Agatha, who has about 15 or 20 books it would be perfectly acceptable to start with!). I suspect this book has fallen victim to its own hype, because I remember when the first English edition was still new-ish (8, 9 years ago) and the story had yet to build a reputation among Western readers, which it now struggles to life up to. There was also a limited selection of vintage-and neo-classical mysteries when this one came out. So people were a bit easier impressed 10 years ago than the spoiled lot we’ve become today. Anyway, I still think it’s a grand and bloody tour-de-force, but can understand why not everyone will be in love with it. That, I feel, sums it up perfectly. It’s not so much that you’d expect it to be the most amazing book ever, but perhaps its charms were more appreciable than its flaws in a period of drought. I would love to see more of Shimada’s novels translated into English, partly to see how his other work holds up and partly because I reckon he must have had something pretty special in him…. Oh dear, given what I’ve heard about this novel I was expecting a more glowing review. And so perhaps I’ll bump it down my ever-expanding list of novels to read. Or at least grab a copy from the library rather than purchase it. In terms of Japanese mystery fiction, do you think you might try one of the translations of Keigo Higashino’s novels? ‘Devotion of Suspect X’ and ‘Salvation of a Saint’ seem to have garnered glowing reviews. It’s entirely possible I’ll try one of them at some point, but there’s so much else to read first! I take it you’ve not read them and can’t make a recommendation? Well, you’ll probably get to them before I do in any case, so let me know what you think! On the one hand, Salvation of a Saint is an impossible crime, and a good one at that. The solution is audacious, but Higashino makes it work, and once you learn why Ayame did it that way, it fits, I think. On the other, The Devotion of Suspect X is the better book, in my opinion. The emotional core of the book is handled better, and the final reveal was more of a gut punch. (Though I was speed reading Salvation a bit…) The ending is a little contrived, but hey, I felt like it worked. Okay, cool, I shall bump them up a little on my list of curios…will probably try SoaS first purely on account of the impossibility, many thanks for bringing yet another book to my attention. Yes, and my opinion is about the same as yours: Good trick (which I got spoiled on, so meh) but very awkward prose. I’m not sure how much of it is Shimada or his translation, I normally don’t have that much of a problem with Japanese prose, but I was speeding a bit, which never helps. Also, I tend to read those other works out loud. I have now read Salvation of a Saint, and…hmmmm, well. The setup is brilliant – it actually reminds me of The Problem of the Green Capsule in how everything starts so simply and then gradually becomes more and more dense as it goes – and by the halfway stage it’s beautifully poised for further exciting developments. And then those developments don’t come. Ever. Instead the same discussions are just hashed out again and again, some blatantly false leads are followed and it all slowly winds down to the solution which, while clever, is only about a third as clever as the glowing reviews seem to think. It’s…unconventional, and doubtless original, but it would be a better solution to a much shorter book or even a short story. Only three years late to this one and completely agree with everything you say about it. Clever, clever solution but by no means fair play which makes the message to the reader utterly pointless. Passed the time nicely, but the scheme is bonkers if you think about it – relying entirely on the behaviour of one character to do at least two things that are contrary to their nature in the second part of the plan seems absurdly risky. Also the middle section drags – the thought that the Azoth might be in plain sight all these years is ridiculous. Yeah, it’s a far from perfect book, and given how the shin honkaku school went on to emphasise logic and fair play you do feel rather that two challenges to the reader overdoes it (there’s no way in hell anyone could actually figure it out from what’s provided herein). I wonder if that’s partly down to the edit, though — maybe there’s stuff missing that would make the case more plain…but then why take it out? !